This classroom package has enough tables and chairs for your entire classroom! Package includes (6) 24x48 Rectangle Hardwood Tables with 20" legs and (24) 14" hardwood chairs. 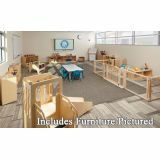 Includes: KYDZ Suite play area (6 48"W see-thru panels, welcome gate), Pick-a-Book Stand, Big Book Easel, 4-Piece Toddler Kitchen, Mini Loft, 30" x 60" rectangular table, 6 plastic chairs, Duplo compatible building table, and lots of storage! Complete set consists of 1 each of the following Woodscapes blocks: WB1470 Platform, WB1471 Half Height Platform, and WB1475 Step and 2 each of the WB1476 Triangles. Made in USA. GreenGuard Certified. Lifetime Warranty. 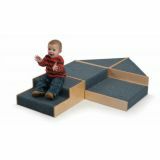 Full Set consists of 1 each of the following Woodscapes blocks: Large Platform, Small Platform, Hill Platform, Valley Platform, Ramp and Steps (all shapes except triangle) and can be arranged in many different configurations.